Over 100 people were murdered, and well over 200 wounded, in a bomb attack against a peace demonstration in Ankara on the 10th of October. However the turkish government proclaims loudly that ISIS is the principal suspect, it cannot hide its own ever growing violence against anti-government dissidence, at all levels. And even if Erdogan’s AKP did not directly place the bombs, they have done all they can, directly and indirectly, since the Gezi Park movement and the loss of their national parliamentary majority in June, to silence, repress and, if need be, kill all opposition. CAN’T BE FORGOTTEN, the murderers CAN’T BE FORGIVEN. 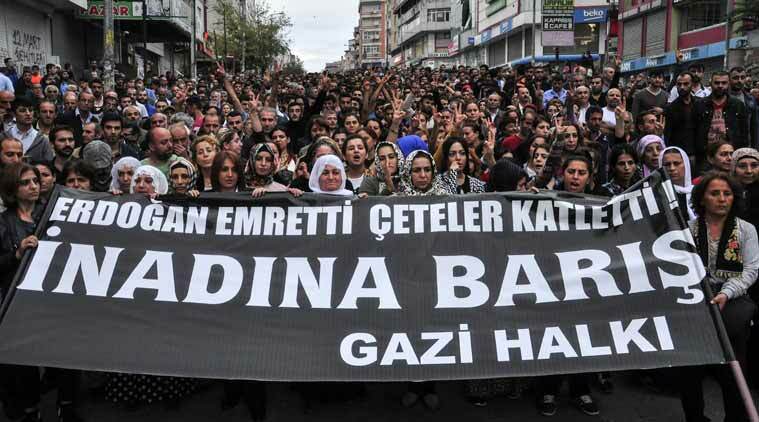 On October 10th, a Peace Rally that brought together many civil society organizations, revolutionary unions, and progressive and democratic parties, among them HDP, was the target of a horrendous attack. Unfortunately, at least 128 of our fellow citizens were murdered in this attack, and hundreds wounded. We are concerned that the death toll may rise, as 48 among the wounded are in critical condition. This attack will go down as one of the bloodiest in the history of our republic. There are clear links between the attacks on our party’s rally in Amed on the 5th of June in 2015, in which five of our citizens died and more than 200 were injured, and the suicide bombing in Suruc on the 20th of July 2015 in which 34 of our citizens were killed during a press conference by youth from across Turkey in support of Kobane, as well as the suicide bombing on yesterday’s Peace Rally in Ankara. To date, none of the politicians in power has been held accountable regarding the previous two attacks. From the political rhetoric of Prime Minister Davutoglu and the ministers he appointed, as well as that of President Erdogan, we see no political accountability with regards to this bloodiest attack in the history of republic. On the contrary, their public statements show a readiness to blame the victims of this attack and our party. Such a political tendency also shows that those responsible for this massacre will also be not brought to justice, and that even the investigation may be hidden from public scrutiny. The Prime Minister’s Office has already censored media coverage of the Ankara Massacre, suggesting that the government will be protecting not only the agents of this attack, but also those in political and administrative positions who paved the way for it. Regarding this chain of massacres, we have a number of expectations and clear demands from the international community and from political leaders. In making this call, we wish to underscore that the Ankara massacre and the aforementioned previous attacks are international in scope, and to make clear that we see the potential for such events to open the way to regional insecurity.AKP’s policy of relying on radical groups as proxies, which began with President Erdogan’s support of, and even channeling through the intelligence organization MIT, the activities of such groups as ISIS, Al-Nusra, andAhrar Al-Sham—used particularly against Kurds in Rojava—is at the heart of today’s tragedy. President Erdogan aims at the realization of a “Turkey-type presidential regime” which will render him as the sole political authority in Turkey. In order to achieve this, Mr. Erdogan needs his party AKP to secure the majority of the seats in the parliament to form a single-party government. Pushing HDP under the electoral threshold (10%) stands out as a straightforward tactic for AKP for this very reason. In order to achieve this, AKP adopted “escalation of violence” as a strategic approach. In a context where the ceasefire ended, the attacks against the PKK have intensified. As the clashes escalated, the death toll of the soldiers were made a basis for creating a systematic wave of lynchings. AKP led fascist pogroms targeted HDP buildings as well as Kurdish groups living in the Western parts of the country on one hand. On the other, Kurdish cities have been kept under military blockade and curfew. Only in Cizre, 21 civilians were massacred by the Turkish Armed Forces as well as the police. At a time when the extreme nationalist and polarizing policies are implemented in Turkey, the safety of the general elections (November 2015) is a vexing question to be considered in a serious manner. Our electorates feel under constant threat in every social space and political activity they attend. In order to maintain stability in the region, it is crucial to prevent the devastating effects of the conflict from spreading over a wider geography. For this very reason, it is extremely important for the international community to take a firmer stance against President Erdogan and the AKP government that have already lost legitimacy in the eyes of the public in Turkey. Hereby, we encourage international community who stand in solidarity, to extend their condolences directly to the peoples of Turkey– not to the state representatives who are politically and administratively responsible from the massacre. This entry was posted in Commentary, News blog and tagged turkey. Bookmark the permalink.